How on earth does one prepare for this trip of a lifetime? Very carefully. 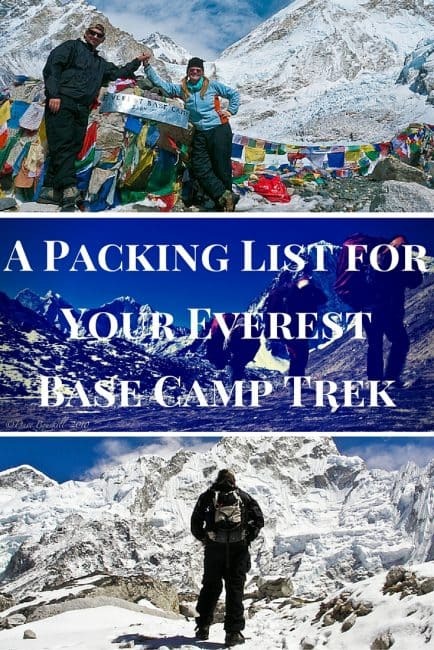 This is a complete guide to our Everest base camp trek packing list. This is it, boys and girls. We are fulfilling a goal that we have had for many years. We are going to Everest Base Camp. It is a little daunting to know that we will be trekking over suspension bridges, climbing along high ridges and spending several days at 5000 meters. But the most daunting task that lays ahead is putting together our packing list for our Everest Base Camp Trek. Here is a list of the gear that we are bringing with us. We made notes beside each item with suggestions of what we should have done differently. But for the most part, we are very pleased with our EBC Packing list choices. 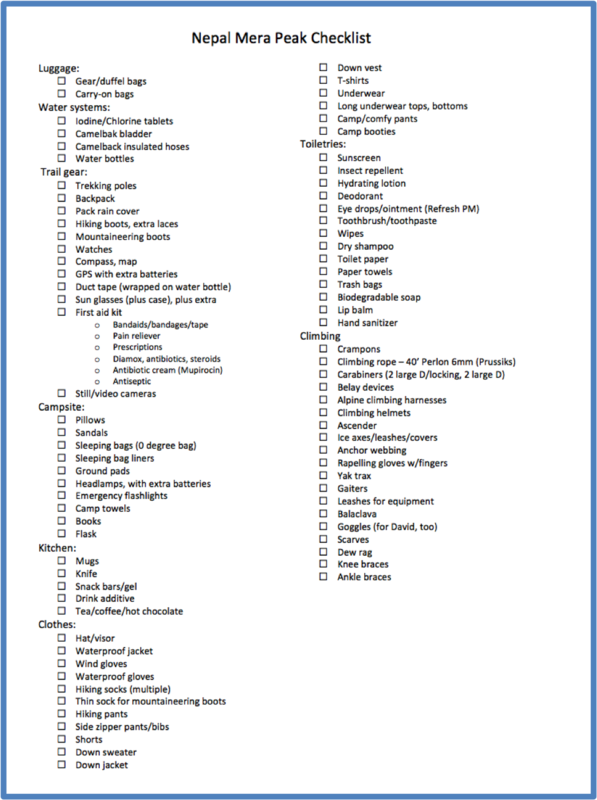 This list is for 1 person, we each brought the same amount of travel gear, but to keep things simple, we are including only what 1 person needs to pack for Everest Base Camp. It is important to pack layers for your Everest Base Camp trek. Weather can change rapidly. One minute you can be working up a sweat as you climb uphill and then as the temperature drops, you will be freezing in the cold. Make sure to have tested all of your gear. Don't wear new boots on the trek, make sure that they are worked in. Also, check all batteries in headlamps and cameras and be sure to have plenty of spares. Layering is extremely important when trekking to Everest Base Camp. To learn more, read our post about how to layer and dress for the winter deep freeze. 1 pair down booties (bought these at Namche Bazar and they saved our feet.) Great for keeping feet warm in room and while sleeping and for in the lodge. 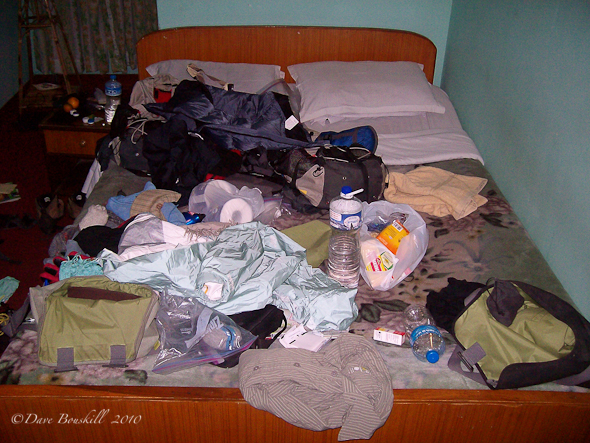 Note: We have since gone over this packing list and found that it all worked very well for Everest Base Camp Trekking. We didn't feel that we over packed at all and we felt that we had enough travel gear to make it through everything we needed. Plus, we felt that we didn't overload our porter Sher, he only had to carry one backpack between the two of us. Since you are staying in Tea houses when climbing to Everest Base Camp, you don't need a lot of extra travel gear. If you find you need more, you can pick up what you forgot at Namche Bazaar. 2 Pairs of sunglasses (in case one breaks) – Believe me, I had a pair of sunglasses break while climbing Mount Kilimanjaro and I regret not having extra sunglasses. You don't want to go overboard on carrying electronics when climbing to base camp. Every extra piece of gear will feel extremely heavy. On the other hand, it's a once in a lifetime chance and you will want to capture as many photos as possible. Tip: Keep batteries close to your body, that will make them last longer. 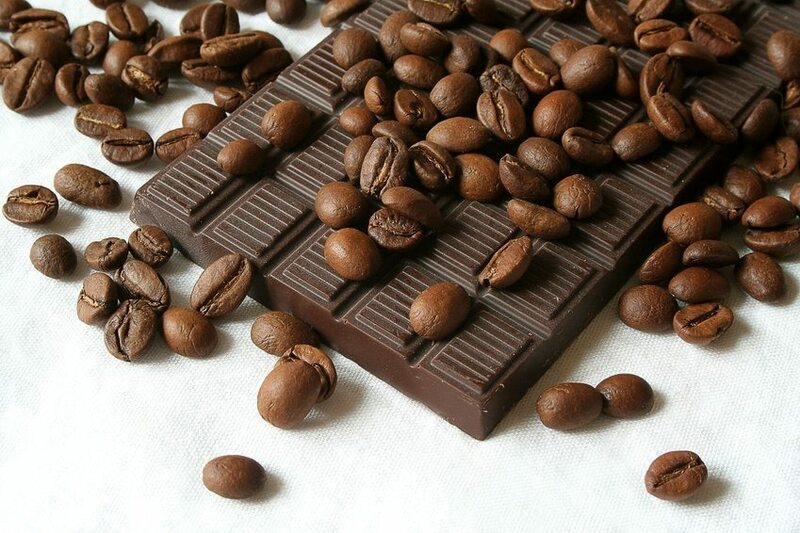 dairy milk bars – chocolate is a must! paperback – Skip electronics, use paper so you don't have to worry about batteries. This is what we got it down to for two people. Map and Lonely Planet – There is a lot to read about on the trek and a lot to see. The Lonely Planet helps you know what to look for. So there you have it, that's our packing list for Everest Base Camp. The Most Complete Travel Packing List You'll Ever See! Anyone else have some recommended gear to pack for the Everest Trek? 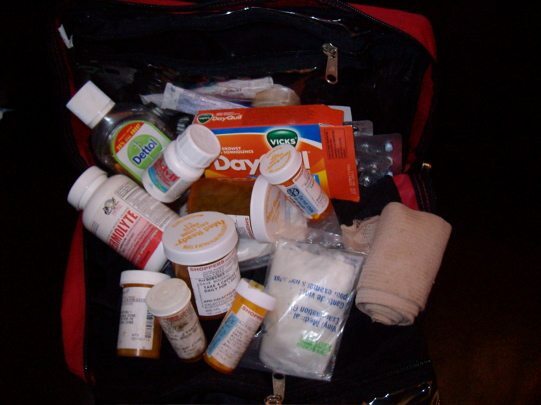 50 Responses to "Packing List for Everest Base Camp Trek"
I am going to Nepal in 10 days and I would like to ask whether I can buy all the medicine you mentioned there or is it better to buy it at home because it is safer? We bought all our medicine in Kathmandu. But to be safe, we recommend having it on hand from home as well. We were traveling for quite some time when we arrived in Nepal and had to re-stock. But we always leave home with what we need. Rules can change and stocks can change, so we advise going to a travel clinic to talk to them about what you need before you go. curious on what to expect on trek in December; leave 12/3/18 and hoping to steer clear of major weather changes; does layering or gear list change? I would contact our guide Dipendra, he would have a better idea of conditions on the mountain. Hi! Going to EBC in April and was wondering how many liters was your day pack. I am considering carrying just a 24lts day pack. In high altitude, how much do you carry in your pack? Hi Paola, our day pack was bigger. Dave’s camera bag is 40 litres, so you’ll be great with 24. We hired a porter and a guide and our porter carried our backpacks with hiking gear and clothes. He always beat us to camp so when we got there we could change into warm dry clothes and socks. I think our backpacks were lighter than our day packs because we carried camera gear with us. haha. 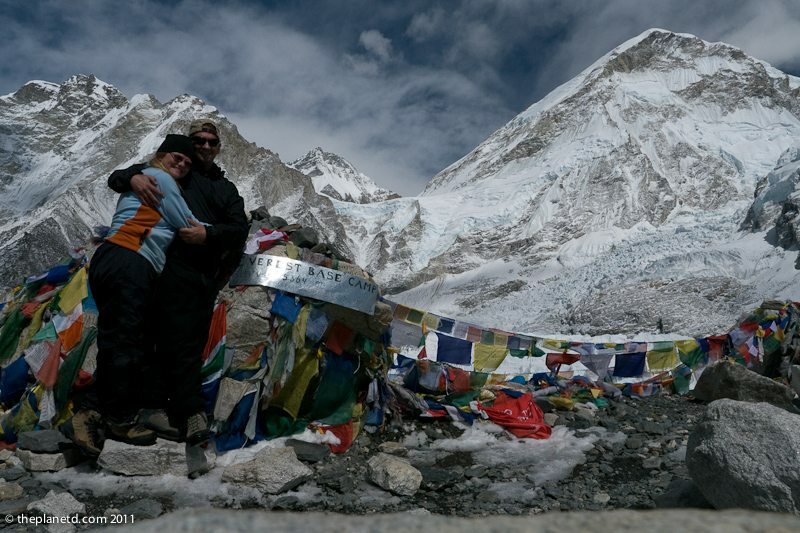 You don’t need a lot of change of clothes for Everest Base Camp, but you do want layers and a couple of changes in case you are wet (I tend to sweat a lot) and want to put on warm clothes once you reach your guest house. Have fun and let me know how it goes! I am doing EBC in March and appreciate this post very much!! I am wondering – did you use water purification tablets? or was boiled water available?? We used water purification tablets then, but I recommend a SteriPen now. You can buy it at any outdoors store or on Amazon. (Here’s an affiliate link to Amazon http://amzn.to/2pd01n2 – Steripens are a great way to purify water and it doesn’t have the medicine taste like purification tablets. But they do need batteries, and betteries can really run out fast on Everest, so I would still recommend tablets as a back up. And remember to keep batteries close to your body when not using them. We take them out of our equipment and in an inside pocket when trekking. Such a brief information you have provide in here. Can you also explain the cost per day including the cost of the hotels and food. Could you tell what kind of boots did you use? How much waterproof they have to be? Is it really snowy on the trail? We did Annapurna and there was just a shallow level of snow and we were wearing low hiking sneakers with ventilation net in some places. And it was ok, feet were still dry. Is track to EBC pretty different? How did you do with your clothes? Did you wash them while in the mountain? We didn’t wash them at all. You just end up smelling a lot. Ha! We both packed enough underwear, lightweight and breathable so itdidn’t take up much space. Other than that we just brought 3 sets of base layers and three (maybe 4) pairs of socks. That way we had something dry and semi clean to change into after trekking while letting our trekking clothes air out. The third layer was for later in the trip and for any emergencies should a base layer get really wet or wrecked. For this trip, we didnt’ worry too much about washing. But I remember there were shops/tea houses that offered laundry services. Just be prepared to hang around an extra day as there aren’t clothes dryers. Have a great trip! Hi! Just stumbled upon this. I climbed kilimanjaro as well and now looking into the everest climb. Would you be able to tell me what some of the differences are between the treks? Why is it about 2 weeks to climb instead of 6? Do we have to tip the porter/guide like we did on kilimanjaro? This kind of info would be fantastic! I’m female going solo again! Hi Sasha, thanks for the message. Yes, you should tip your porter and guide. It is a 10-11 day climb because it covers a lot more distance. It is also a sustained climb over 4000 meters for the entire trip. Kilimanjaro is only twos over 4000 metres and then you come down the same day you summit. Once you reach Everest Base Camp, you stay up there that night at Gorep Shep. You then start to come back down. Thanks for your list! It is very thorough and things I did not think of. 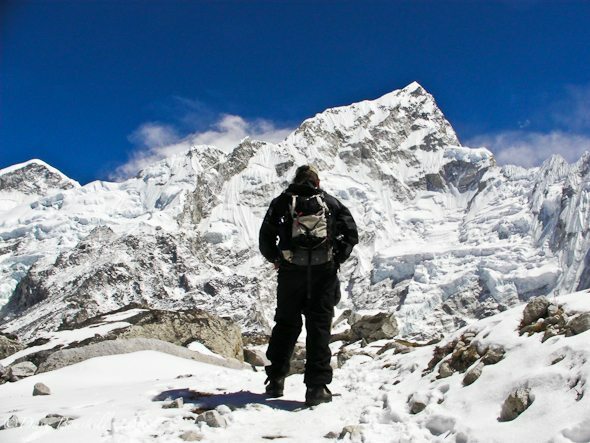 I am heading up to do everest base camp mid november….just me and a guide. Never done anything like this before … so all the information was helpful. We had a question about “expensive” charging. Do you pay per outlet used, or is there some other way they measure how much electricity you consume? Good question, they pay a flate rate per hour and per outlet. It can really add up for sure. Thanks DebnDave for the super super Journal. I am heading to the EBC in another 4 weeks and this surely helped calm some nerves. Hope I am in good enough shape to go the distance and enjoy the journey too !! Hi Rahul, you’ll be fine. 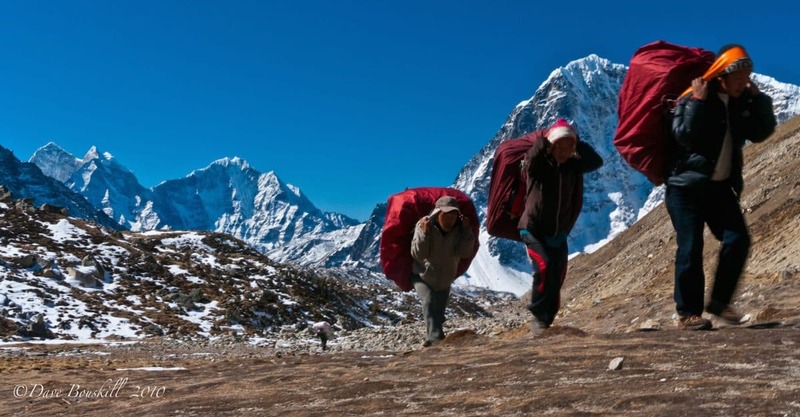 The great thing about trekking to Everest is you can take it as slow or as fast as you wish. Give yourself enough time to rest and get used to the altitude and you will have a very good chance of getting there and feeling great in the process. Make sure to drink plenty of water. Cheers. Leaving tomorrow for Nepal to make an expedition to summit Mera Peak (6,476 m). Your packing list was great. If you look at our latest blog, you can see our own Nepal gear list. Keep in mind we’re doing a summit, so we had to have climbing gear. Hi Chris, have a great time. Yes, I am sure that you have a way better packing list than us doing an expedition. Ours was pieced together from shopping in Kathmandu. We had been traveling around India and Sri Lanka for quite a few months before going to Nepal, so we had to pretty much start from scratch there. Have a super climb and we look forward to following along! Interesting. I did this trek end of December 2010. Backpacking was very difficult. I had a backpack of 19 kg and I just wonder how could I get easier in the future. I’ve become a recent daily reader of your blog. My boyfriend and I are heading to India and Nepal for a few months in September and therefore I find your posts even more helpful! I didn’t even think about doing the Base Camp Trek before, but your posts have inspired both of us too get in shape and head out for one crazy/beautiful adventure. Thanks for all the advice, sounds like we’re going to need it! .-= Nicky´s last blog ..Bigger, Brighter World (Amaris Lasik) =-. Nicky thank you so much for the kind words. You can totally do the Base Camp Trek. Just take your time and drink plenty of water and take diamox. They sell it for really cheap in Kathmandu so don’t bother spending the money and a doctors visit in North America. I can’t wait to hear how your trip goes in both India and Nepal! My dear Friends, Dave & Bed, I am reall impressived about the website. 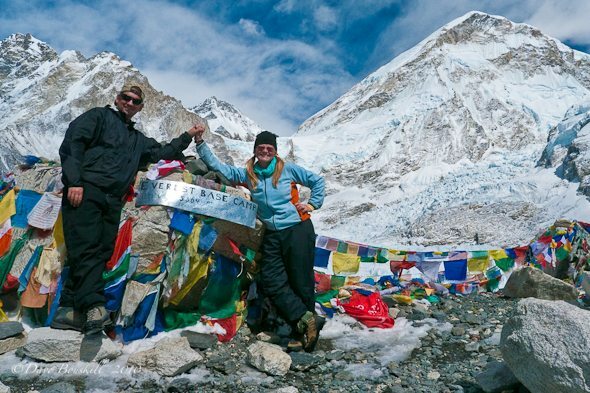 I feeled that I was so great to be your Guide for Everest Adventure trekking. Hope you will also help me to bring my future in the light path from the dark. BTW, how much did the package cost you? 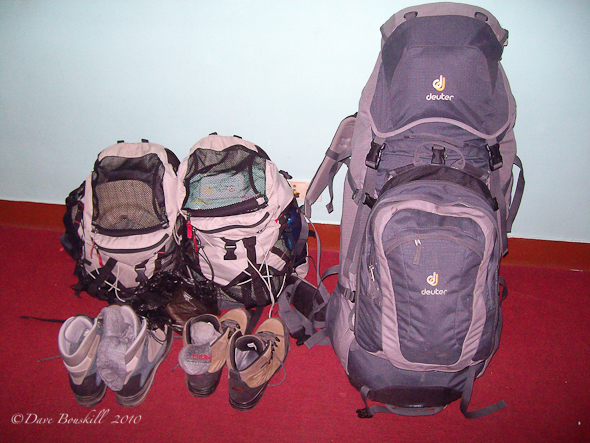 .-= flip´s last blog ..How Cheap is Cheap Backpacking? =-. Well of course I agree with everyone! I am looking forward to reading the followup to find out how you’d adjust your packing list based on experience, and I can’t wait to see what is sure to be more stunning photos! Enjoy it and be safe! Wow, good luck with your climb. Can’t wait to read how it went. .-= Maria Staal´s last blog ..The University Library Challenge =-. I’m so excited for you guys! Can’t wait to see amazing pictures from Dave and story from Deb. .-= Amy @ The Q Family´s last blog ..Best 5 Fun Things to Do with Kids in Columbia, SC =-. I am so excited for y’all. This is something we have very much talked about doing and can’t wait to hear how it goes. .-= Akila´s last blog ..the currency of kindness =-. I’m with Laura–would love to see which of this gear you don’t end up using. Best of luck on your trek! Try to make it to Kala Patar or Gokyo Ri if you can…much better views of the Himalaya than Everest Base Camp. Much less touristy as well. .-= Alan´s last blog ..Abroad Care, Stage 1: Forming an LLC =-. (another Laura haha!) I am so jealous! You guys must be so excited. Can’t wait to hear about the trip, have a great time! Thanks for sharing the packing list – I’m sure it was a daunting task. What a great start to your Everest Blog! I’m so excited to hear all aboutit, as it’s been difficult to carry on my bragging rights to you without all the details, LOL! Enjoy, and talk to you soon. I’ll have to go shopping (I knew I would have to) as I sent much of my cool weather gear home before coming to SE Asia here. I”m heading to Everest Base Camp in October so thanks for the post. I’d love a packing update when you get back to hear what you could’ve done without or what you may have needed. Have fun!! .-= Laura´s last blog ..Montage Monday: Pompeii’s Victims =-. Hello. Thank you for all this valuable information!! I am leaving in 2 weeks to do this 15 day adventure, and I couldn’t be more excited!! I do have one more question: My camera has a rechargeable battery (ie, not rechargeable individual batteries, but one battery that needs to be charged). What do you recommend for this? Is electricity available as you go up the mountain?? I know you said something about charging batteries and that it is quite expensive, so are you paying for the use of an electrical outlet? Any info would be great! Thanks a bunch!